Our Angular Lines business card design template blends visual excitement with minimalism, a perfect design for practically any type of business. The front showcases your name and contact information in a solid, angled color block. A parallel line matches the angle and serves as a division between the color block and a white background featuring your logo in the forefront. The back takes a minimalist approach by incorporating an angled middle line that divides space between your company name and website URL. Customize Angular Lines to match your brand by choosing one of three different color schemes and four unique die-cut trims; then, personalize it with your own logo and custom text. 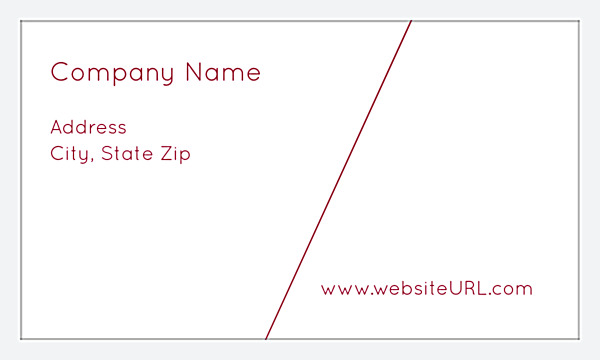 Personalization is simple when you take advantage of our online business card design tool. Follow the prompts to pick your colors and shape, then edit the text and upload your own logo. For more fine-tuned customization, you can add additional text fields, adjust the layout, change fonts, and even add more images. 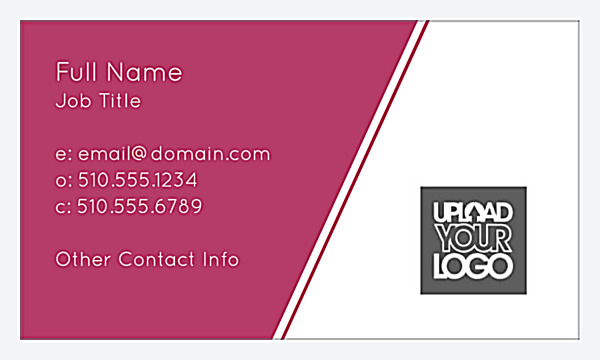 There’s no easier way to design a professional, custom business card – no designer needed! Get affordable business card printing at a great value with PsPrint. We routinely offer discounts on high-quality business cards printed on premium paper stocks. Our soy inks are eco-friendly and more vibrant than traditional petroleum-based inks, so you can print beautiful, bright business cards that command attention. Print better business cards for less, all backed by PsPrint’s customer satisfaction guarantee.